(Update: June 13, 2018. The older versions are below, just for the record. 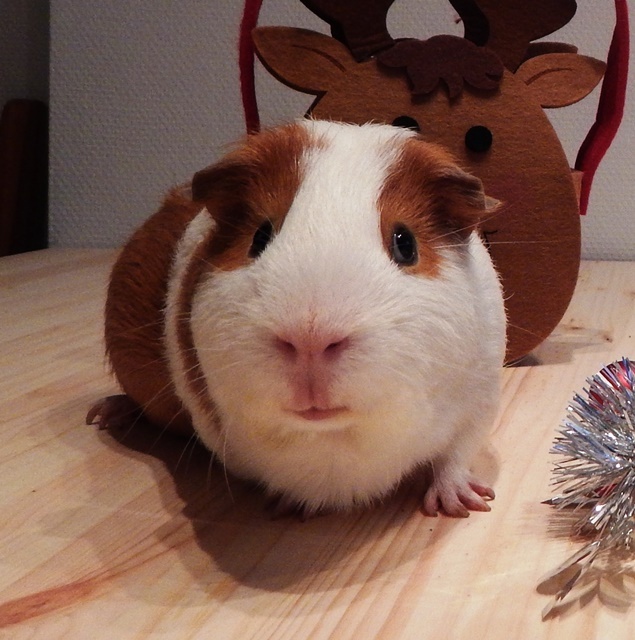 We are The Guinea Pigs’ Gang. Four piggies living in a green city with two human adults and two human toddlers. So help us all gods that you could find on Google! Things have changed from our last “introduction”, so there you go, this is an short update on the team behind the blog. A prima donna who loves to cuddle. Lazier in the past months. In good health, in general, just a minor recent surgery to remove a mammary tumor. And he is extremely tolerant with the toddlers. Still crazy. Still white with grey ears. 🙂 And still a big chit chatter. He had some teeth issues and a very scary jaw surgery, but now everything seems to be well. Active and running around, chasing Data whenever he is in the mood for. Doesn’t even blink when the toddlers are jumping up and down around him. Still very tolerant with Spock. Still white with pink ears. He has some issues with his jaw, but hopefully we found a solution. And he lost some weight, but now he is stable and fit. Our newest member, his personality still a mystery for us. To be discovered. But he seem to enjoy his new friends and living arrangements. This sweet little guy passed away this year following a pneumonia. We are still very affected about this and we regret a lot the way we had managed the situation. Crazy and sweet. Loves the piggies and helps with them. She even asked to keep Kirk’s company after Worf died. Oh, and she loves their veggies. 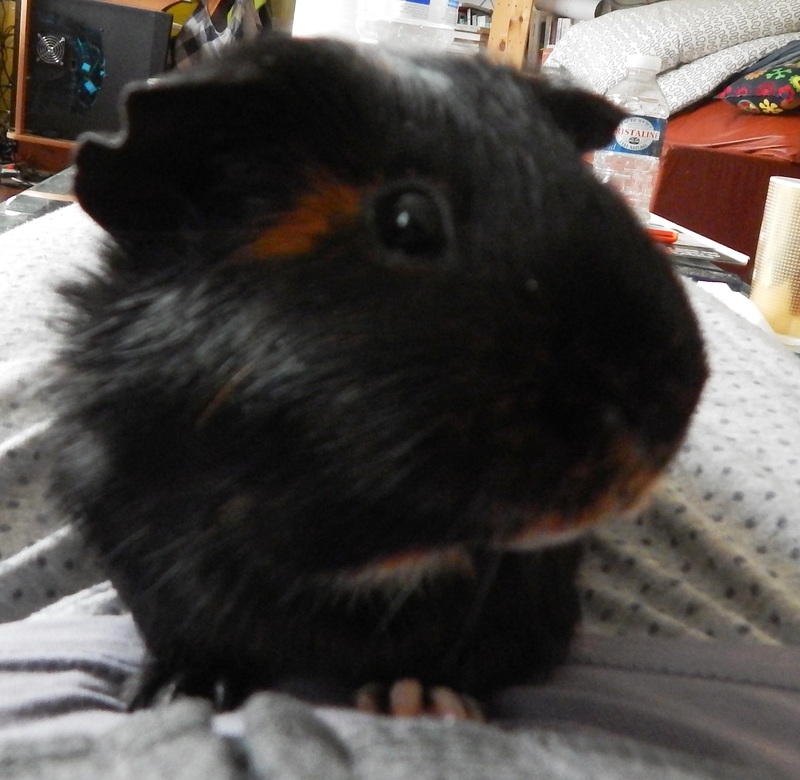 Just starting to understand the world, but deeply enthusiastic about the piggies. He climbs the couch and bends over the fence to pet them, and they are crazy enough to let him do it. He also loves to drink water from their bottles. Main human servant, responsible with taking appointments, cleaning the cages, organizing the menu, giving medicine etc. The other human servant responsible of grocery shopping, cuddles, checking on us, transportation to the vet and back etc. We are four piggies living in Brussels, Belgium, Europe, Earth, Solar System… All four boars, territorial, spoiled and with huge personalities. We have two human servants, a human female (referred to as the hf on the blog) and a male (the hm). They were well trained and we always have fresh veggies and clean rooms. We live in a penthouse that is the main piece in the humans’ house: the living room was arranged in a way that allows us to keep an eye on them. I am a proud male of 1.35 – 1.4 kilos, depending on the amount of pellets I can extract from the humans. I love to eat fresh veggies and pellets. And of course that I love to sleep and also bully Worf whenever we get together in the house. 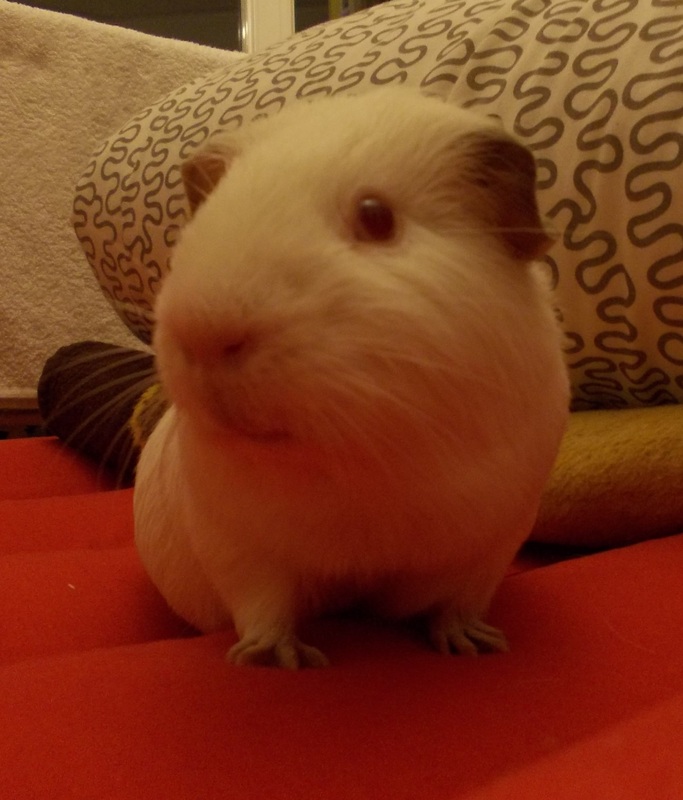 I am also a “drama queen” that loves attention from humans and other piggies and I can be very loud in claiming what I deserve. 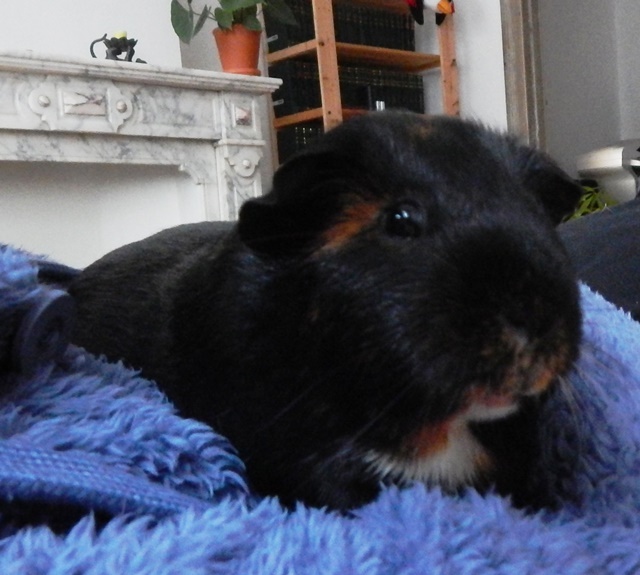 Of course I am also jealous and whenever I feel the scent of another piggy on my humans I will mark my territory. I still have my psychoanalytical skills and I hadn’t give up of my judgemental looks. I am a shy guy of a constant 1.15 kilos. I sport a white bum and some very interesting marks on a silky fur. I don’t like wide open spaces and heights. 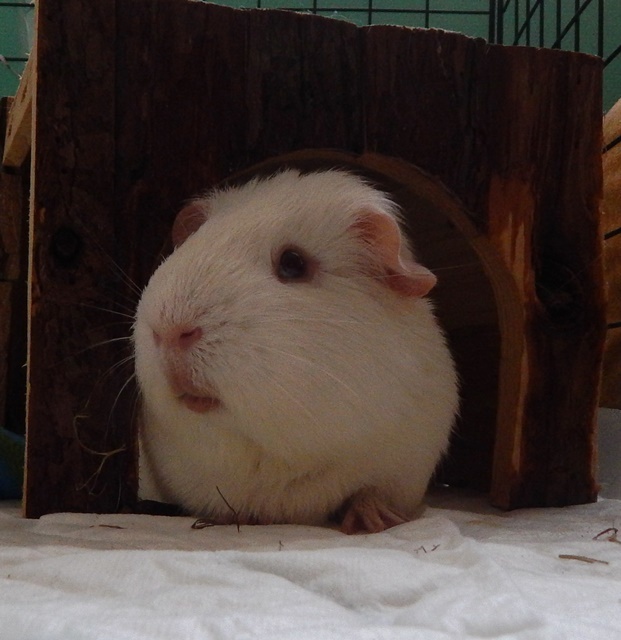 I always finish all my veggies and never pull my hay down to play/pee/poop/sleep in it. My favourite activity is cuddling and sleeping in the hf’s fluffy anorak. I could stay there forever and I am always upset when the humans are pulling me out and re-put me in my room. OK, I admit I am the crazy and fierceness one. I will lead the Gang into battle if necessary! If they don’t hide before… I am not even afraid of the vacuum cleaner. I tolerate humans around, but for sure I don’t allow them to hold me in their arms for more than 60 seconds. Although, I reckon that from time to time a little scratching between my gray ears is nice. I share my room with Data and I love moving the wood house around while he’s sleeping inside. By the way, I do not tolerate intruders on my couch: the only human allowed to sit there is the hf. 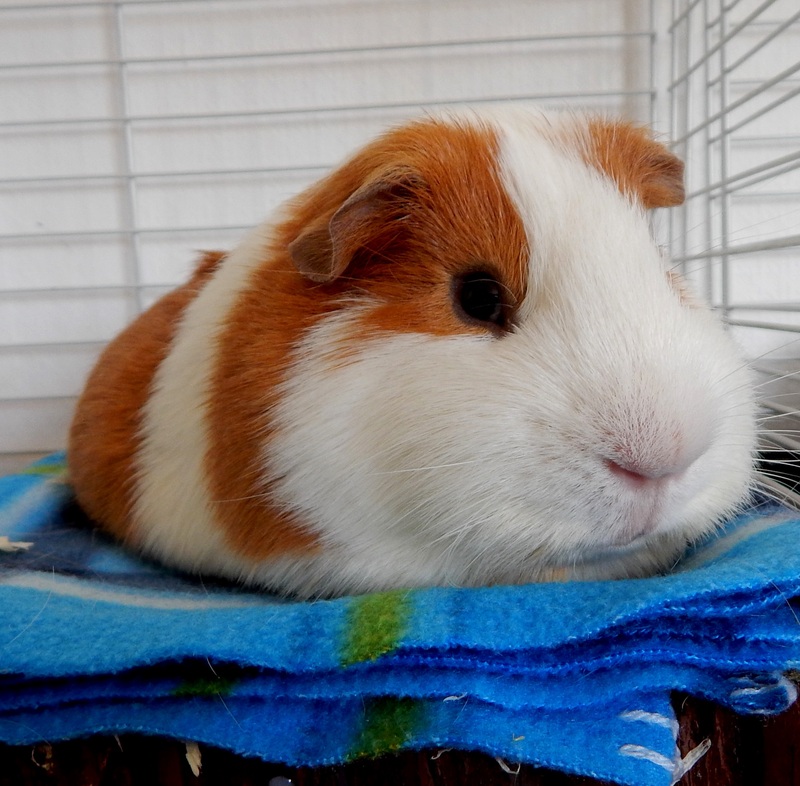 And I’m not talking about some fleece couch imitation for guinea pigs, but about the real couch in the humans’ home. I am the white piggy with pink ears (Spock has them grey) and I am also the only one that manages to share the room with Spock. He chit-chats a lot and is very active, so it’s not easy. My favourite thing to do is pulling out the hay, spread it on the floor and then sleep on top of it. Of course, pooping and peeing also. I don’t go often on the couch, but from time to time I follow Spock, who taught me a lot of mischief. I tolerate cuddling only in my terms, meaning while I’m in my room, on my territory and for a short moment. Still, the hf finds me sweet. This blog was born in January 2014 featuring Kirk and Spock as the story tellers. 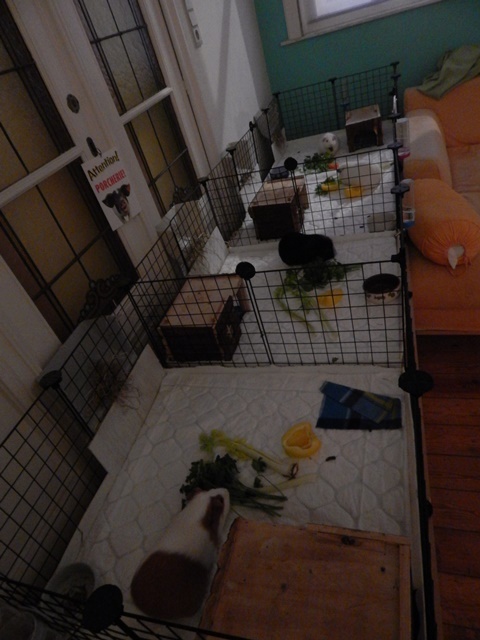 In the meanwhile (March / April 2014, to be more precise), two new troopers, Worf and Data, joined the gang and we became The Guinea Pigs’ Gang. As incredible it may seem, we have different personalities and we see the world in different ways. But our common point is making fun of our two humans and the way we exploit them. As a general introduction, we are all males that love being territorial so sharing the same room is not possible. This is how we ended up occupying half of the living room with our Mother Ship. By the way, we live in Brussels, Belgium, and English is not really our mother tongue. For more details about our personalities, preferences etc. take a look below: each of us took the time and the opportunity to introduce himself. Hi! I’m Kirk, my approximate date of birth is 15.01.2013 and I am very proud to be weighting 1.35 kilo. I love being cuddled and to eat. Actually, eating is my favourite activity. I even developed a special technique that requires less moves: I lean my head on the pellets’ bowl, eat form this position, fall asleep also like this. This way I don’t need to waste time getting up and walking. Also, I claim my food very loud, my favourite part being the waking up of the humans early in the week-ends. I am also the psychoanalyst in the Gang, my judgemental looks being much appreciated among the others and the humans. Hello! I am still shy around humans and not yet used with them touching me, but the others told me it will come. 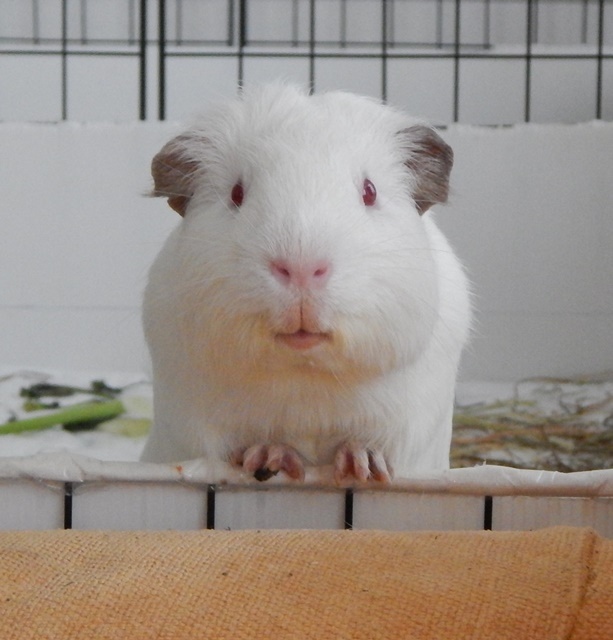 I eat almost as much as Kirk does and I can wheek even louder than him. I’m still young and don’t know a lot about myself, but life outside the pet shop seems to be nice. I’ll update this when I’ll be brave enough to get on top of my wood house and let people take me without freezing from fear. By the way, I have no idea about my date of birth (we are still trying to find it out) and I am wearing a three colours fur. You think Spock is active?! You haven’t seen me! 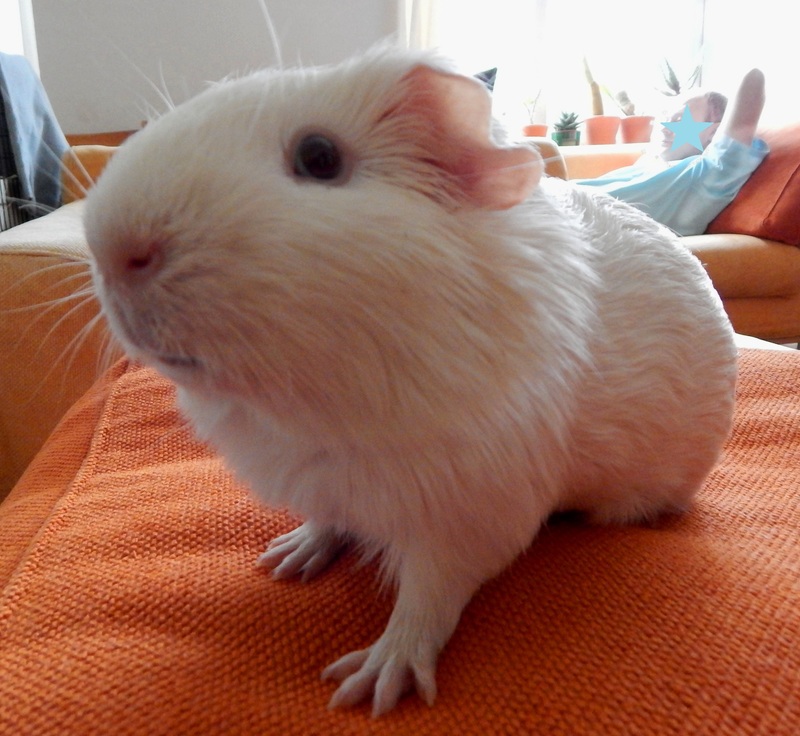 But I think it’s common to the white fur, red eyes piggies. I love to eat and I’m afraid of sharing: I take my food and hide. It’s a childhood trauma: I’ve spent several months in the pet shop and I even shared my cage with some rabbits… So I’m a survivor and a fighter! I also have transparent ears and I love vegies. And have no idea what else I could tell about me. Oh! I love popcorning and running around like crazy. Hi Kirk and Spock, I love your blog and have nominated you for the Liebster Award. If you are interested in participating, just follow the link and it will explain the steps you need to take. Greetings Kirk and Spock! I see you have new friends for the gang. I have only recently started following your blog but I already love what you are doing here.This is why I am nominating you for the Versatile Blogger Award.